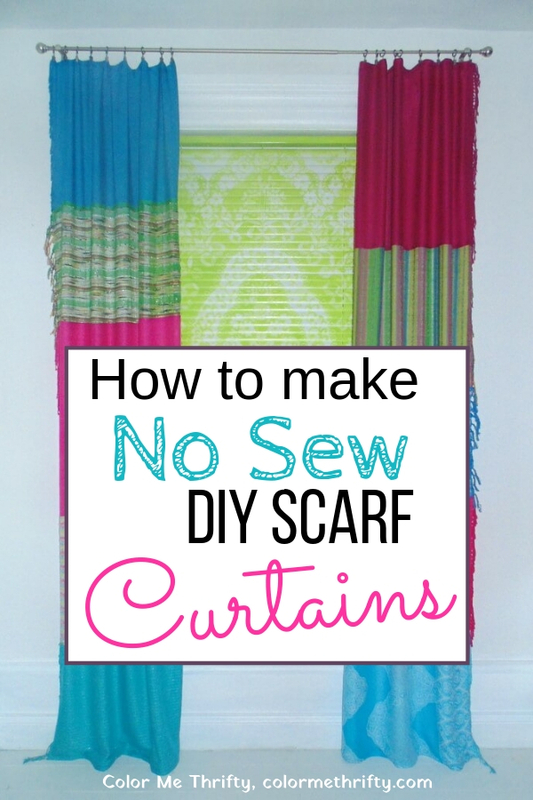 This project has been a long time coming, and finally I’m sharing how I made no sew curtains from scarves for my living room windows. For me decorating is all about creating things that make me smile. Things that you won’t see everywhere else. But also things that can be easily changed up to suit any decor style and/or color scheme, and I’m always trying to find an inexpensive way to do all of that. 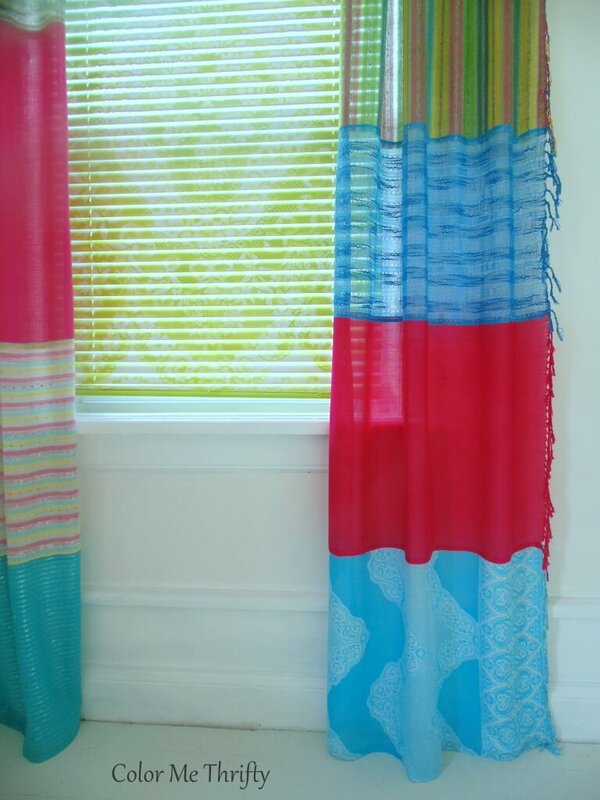 For my decor style these no sew scarf curtains had to be fun, colorful, and inexpensive. I started collecting scarves for my curtains about a year ago. Not the square kind, but the long kind that has fringe on the ends. It took me some time to find enough because I was looking for specific colors… blues, pinks, and greens. The colors had to be light, bright, and happy. 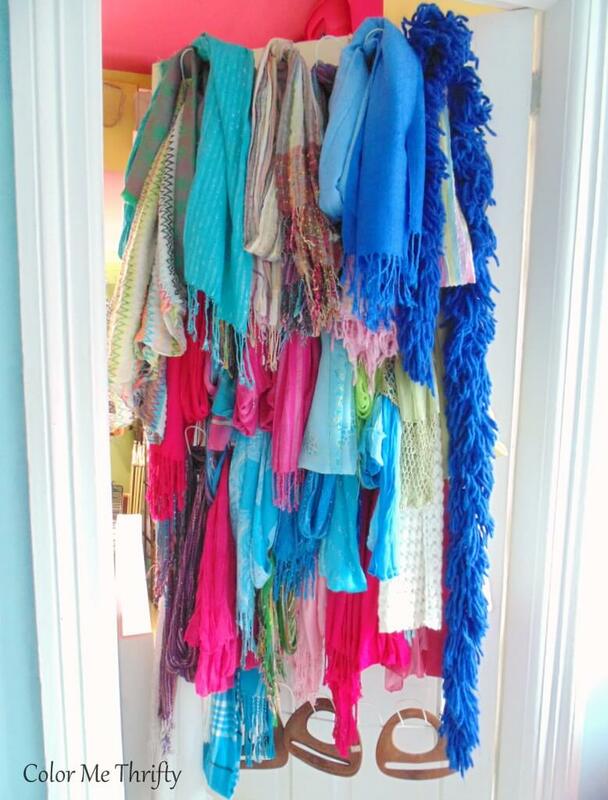 While I was collecting them I stored my scarves using a metal shoe rack on the outside of my craft room door. Once I thought I had enough scarves to start making these curtains happen I brought them all down to the living room in a pile. Funny, the pile looks so small in the picture. You wouldn’t know there are quite a few scarves there. 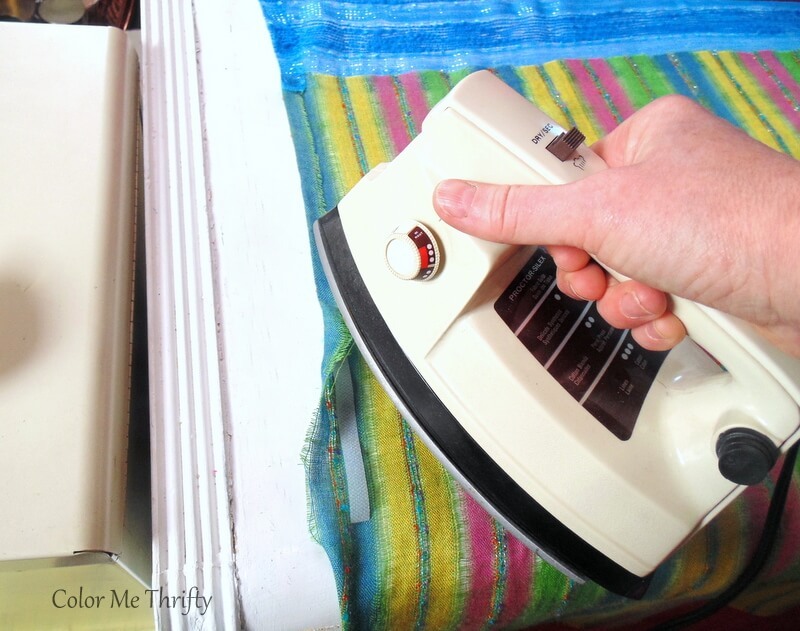 The first thing I had to do, and the most unpleasant I might add, was give all the scarves a good ironing. This was totally necessary so I could better see their length and width. If you ever make these curtains don’t skip this step, no matter how tempting it might be. And I can really relate to that temptation. lol. Some scarves were pretty wrinkled from just from being in storage, and some had wrinkles as a part of their style and they almost doubled in size after ironing. Regardless of why the wrinkles were there they all had to go. TIP: Don’t use scarves that are stretchy. It’s important that no matter what the fabric, they need to be solid. Here’s my pile of scarves after I finished ironing. 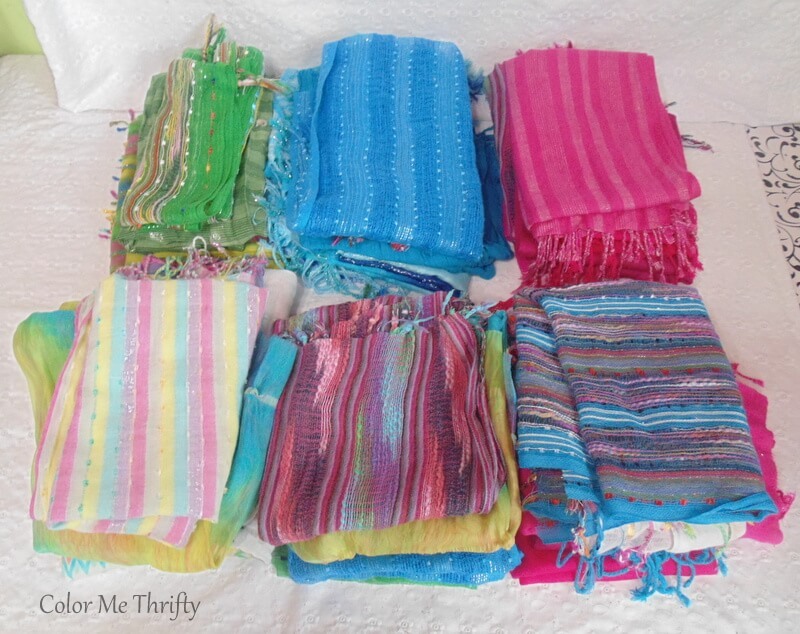 I found most of these scarves at thrift stores for 50 cents each, and a few were $1. This project would have happened months ago, but I was having a heck of a time finding enough green scarves. Not sure why, but finally when spring arrived I found the few more that I needed. To make this whole curtain thing happen I used Heat n Bond iron on hemming tape. 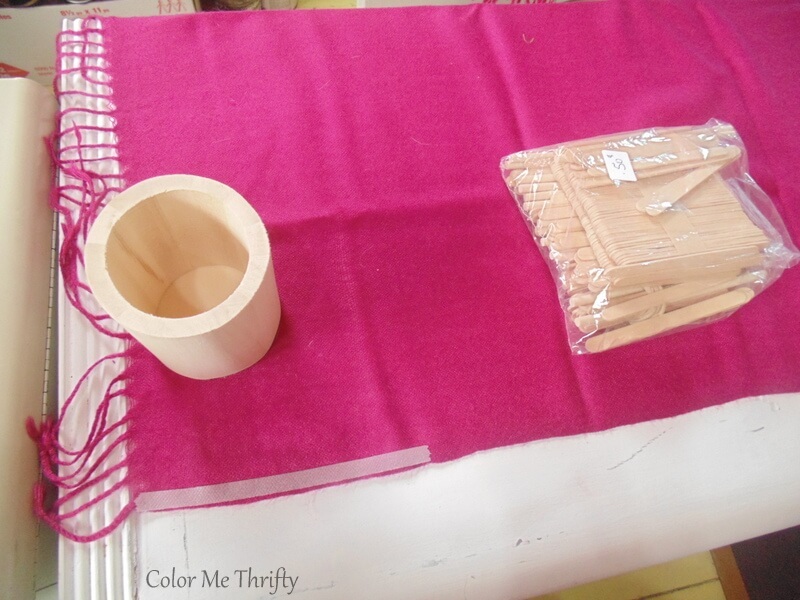 So perfect for non-sewers like me, and also fabulous for this project because some of the scarves were very thin. I’m 100% sure that an inexperienced sewer like myself would have damaged some of them by trying to sew them together. 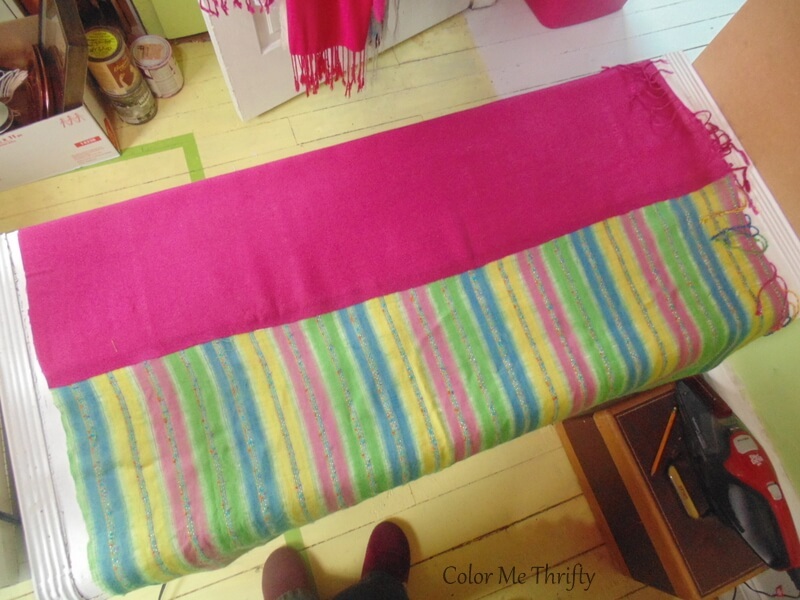 First I measured and cut all my scarves to the width that I wanted for of my curtains. Most of the scarves were between five and six feet long. I was able to get two pieces out of most of the scarves. 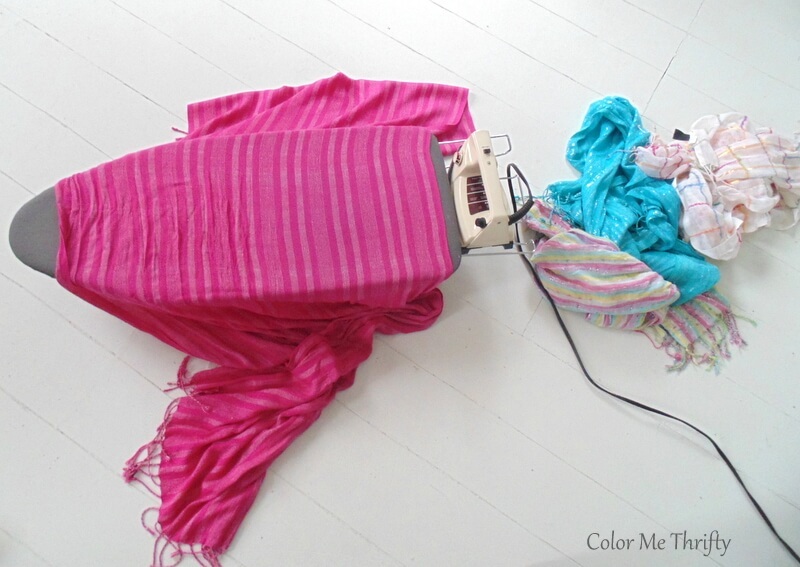 So then I just had to start going for it, so I grabbed a pink scarf and laid the heat n bond down in small strips. 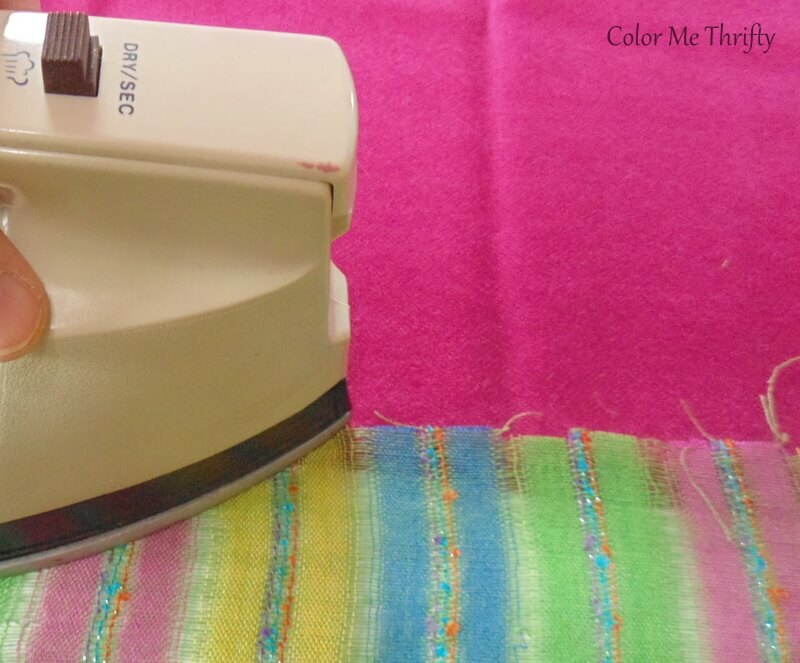 Then I ironed my next scarf piece to that. I just randomly added scarves as I went. I knew I wanted to mix up the colors and patterns so I just winged it. If you want to do a bit more planning you could certainly lay the scarves on the floor to see how you want to put the patterns and colors together. 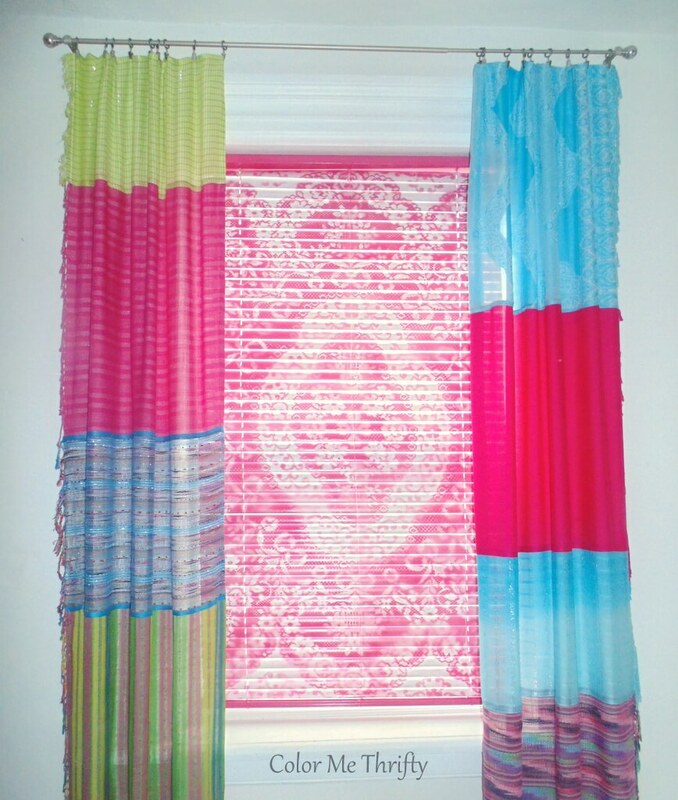 … until the scarves were bonded all the way across. As you can see in this pic I’m keeping all the fringe ends to one side so I only have to hem one long side. Yay! 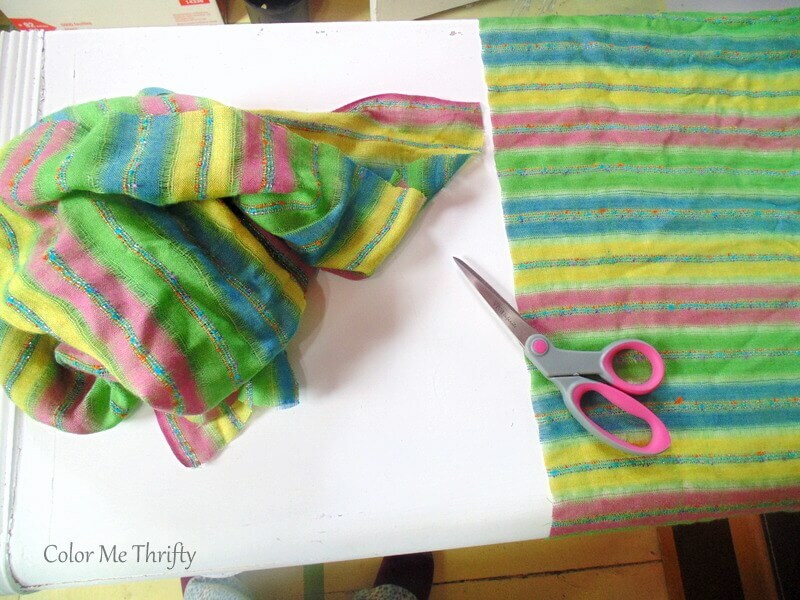 Once I had all my scarves bonded together I hemmed the raw side, and then top and bottom. 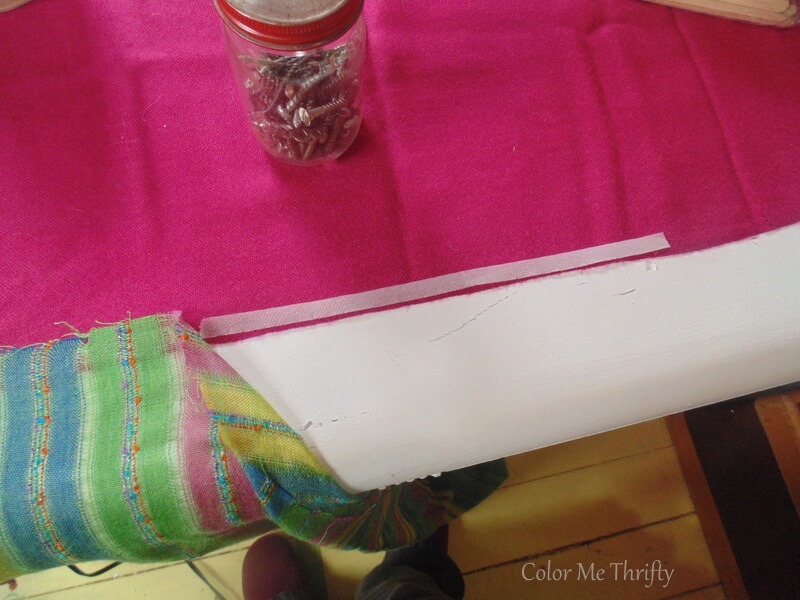 TIP: Before hemming the top and the bottom I hung up my curtains and measured and pinned before cutting and hemming. 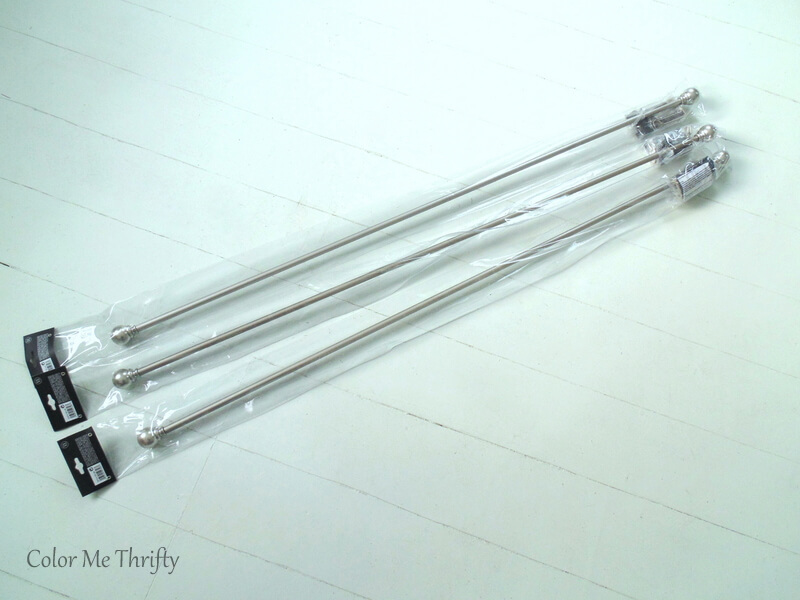 I found these awesome silver metal curtain rods at my local home improvement store, and they were fairly inexpensive at $10 a piece. 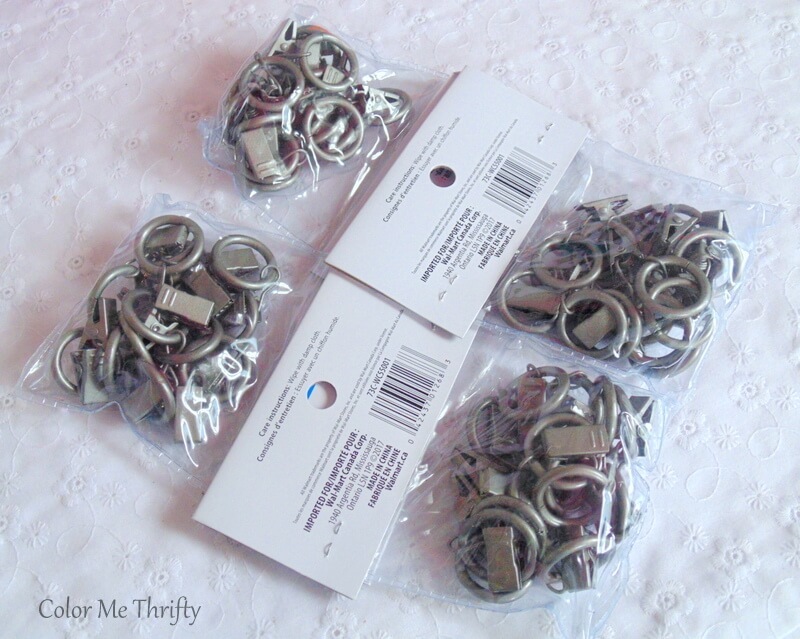 Then I needed some curtain clips for flexibility of hanging. These were $5 a piece. 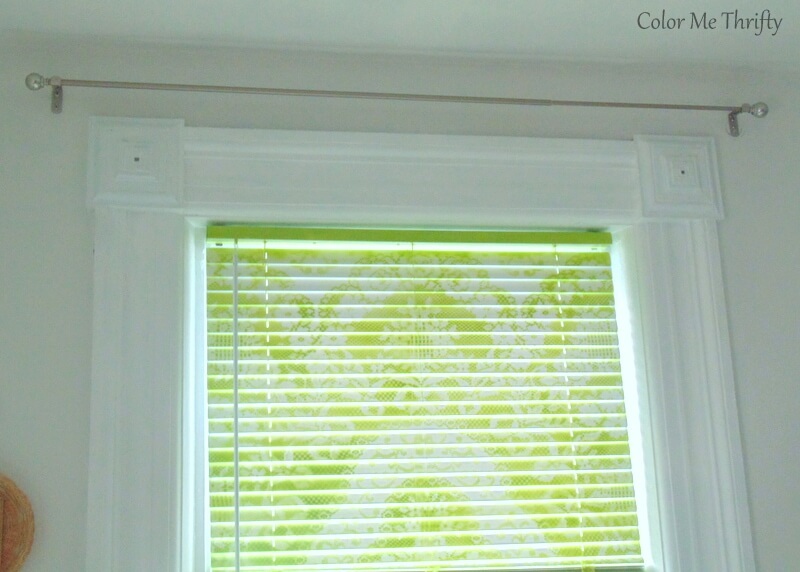 I did the living room window with the green spray painted window blind first. Our living room ceiling height is 9 1/2 feet and I wanted the curtains to hang just a few inches from the ceiling so I measured down about 4 inches, marked, drilled, and installed the curtain rods. 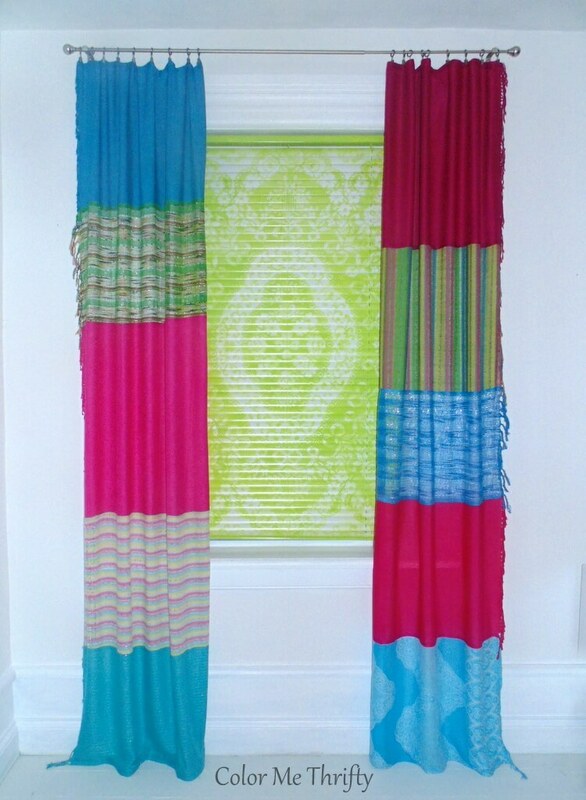 My scarf curtains have a sort of funky patchwork hippie vibe to them that I really love. I decided to do double hems on the tops and the bottoms to give them more strength, and to give the clips something to hang onto. 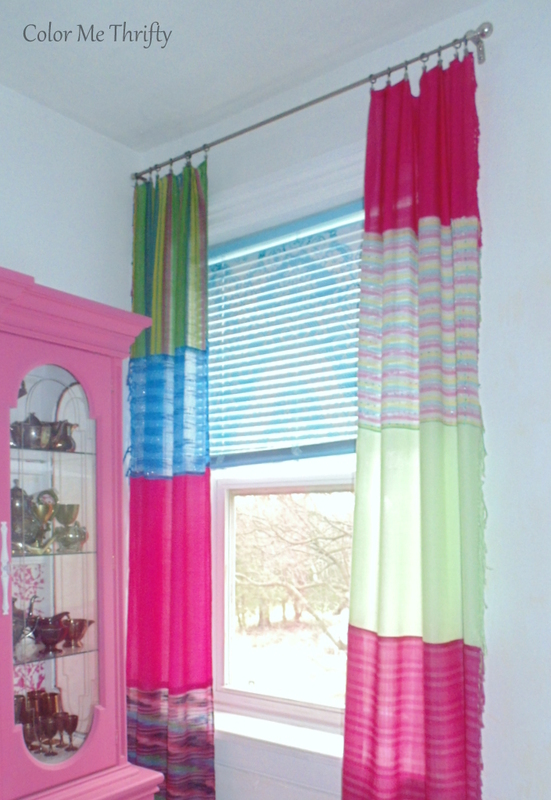 And I can reverse the curtains on the clips, by putting the bottoms at the tops, to change the look if I want. Because we have three cats who sometimes sit in the windows I’m putting the fringe on the outside. They honestly have enough play things and don’t need any more. lol. This is definitely a project where you just have to go for it and not worry about perfection. The lines won’t be straight as arrows, and that’s totally ok.
Now, here’s peek at the other two windows. You’ll get a better look at these two windows when the living room makeover is done. 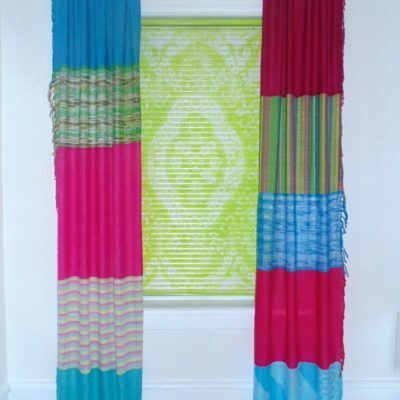 But I just wanted to point out that because of the random combos of the scarves I can move the curtains around, and mix and match them in the windows any way I like. This is the smaller window where I used the curtain panels that were a little narrower, and I put the curtain rod at the same height as the other two windows so the curtains all hang the same. Also this window’s molding butts right against the wall so when putting up my curtain rod I had to leave the one round finial off. But you don’t really notice it at all. 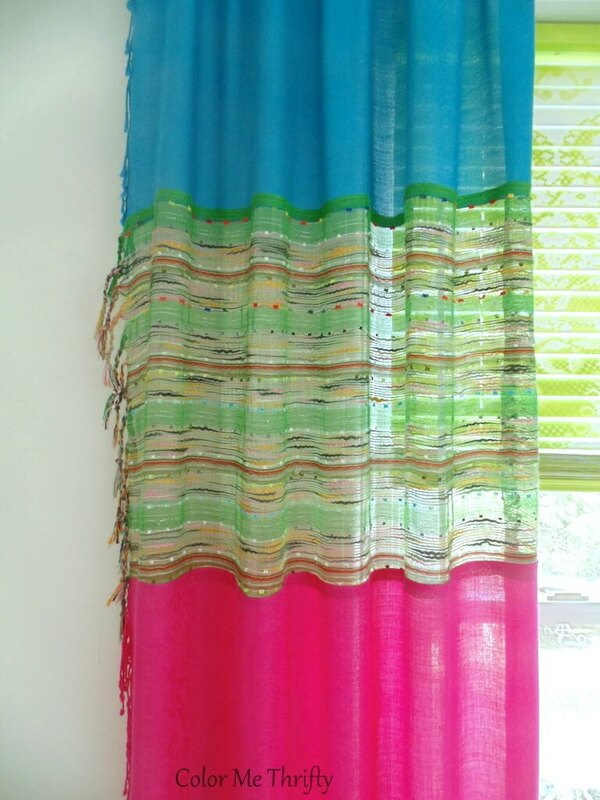 These no sew curtains made from scarves is a great window solution for someone like me who needs change every once in a while. I can move them around to my heart’s content for a different look whenever I feel the need. 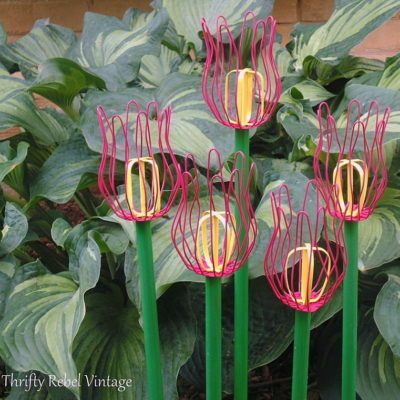 They go well with my hanging throw, and my ReStore wing chairs. I guesstimate that I used 15-16 scarves for these curtains, at a cost of somewhere between $8-$10 dollars. The curtain rods and clips cost $50 altogether. Making them took three afternoons and there were a lot of trips up and down the stairs to hang them as I went to check on what they looked like as I was going along with each panel. Who knew making curtains could be so much exercise. lol. Overall, I’m very happy with how my scarf curtains turned out, and super happy with the price. Three large windows for about $60. Works for me! And they match the vision that I’ve had in my head for a long, long time. 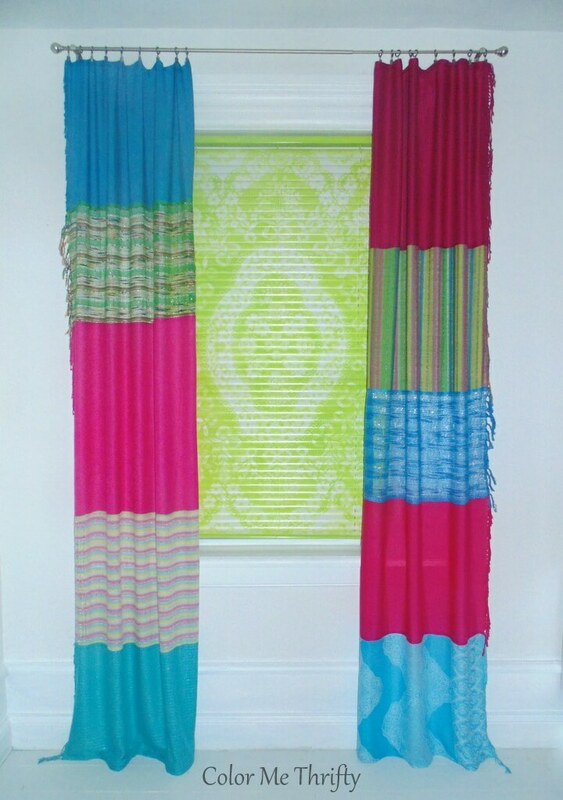 These scarf curtains could be created in so many color combos, or monochromatic would work too. The possibilities are endless really. Save this project for later by pinning! This is so my style! LOVE the fringe and colors and just Everything about this. I actually do sew but like your initiative to do it with heat bond tape. Clever and hippie chic! Thanks for sharing all your ideas and fun projects. Thanks very much Molly Jo! I have to admit to being a bit sewing challenged. lol. 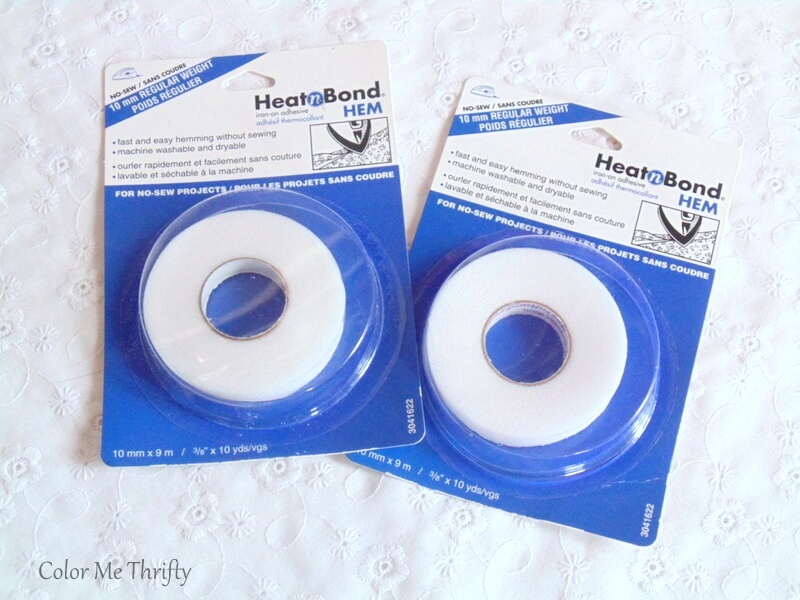 So the heat n bond is a real project saver for me. Thanks Lora! They are definitely hippie, and I am starting to see the living room come together. Now the only big project left is the floor and the stairs. Hopefully it doesn’t take as long to get that done as it did the curtains. lol. I like what you did. My cats are really dorks. Fringe on either side would be a temptation for them. My washroom window is higher and I could see it working for that room. Such a unique idea. I love how your mind works. Thanks Olivia! My cats haven’t even noticed the fringe…. yet. That’s a big yet. lol. Well once again you have amazed me! Those look great! I could see darker, more muted colors used in a boho room! Thanks very much Tania! The awesome thing about projects like this is that they can be totally personalized. The idea definitely lends itself to boho, which I think isn’t quite colorful like hippie. Your creativity and “outside the box” thinking never fails to inspire me. Your curtains are AWESOME! The living room looks so happy😀. 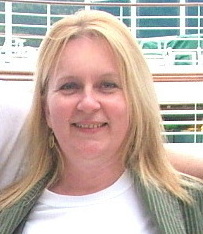 Great job with the new blog look as well and thanks for sharing your wonderful ideas. Thanks so much Fran! Happy is exactly what I’m going for. Happy hippie! lol. I’m so glad you like the new blog look! What a great idea! Love the hippie vibe. I visit thrift stores often and do not think I have ever seen scarves at the prices you mentioned. Of course everything seems to be expensive in California, thrift store or not. Thank you for sharing. Thanks Nancy! We live in the country so prices are a lot more reasonable. Whenever we go to the city I’m quite shocked by the thrift store prices. Maybe garage sales would be a good place to try.. I just LOVE them and now I know what to do with all my millions of scarves!! Thanks Mary! How lucky that you already have scarves to use. 🙂 If you do make some curtains I’d love to see them. Sorry on your name spelling. I know how to spell it, but this iPhone thinks it knows better. Beautiful job Tula! 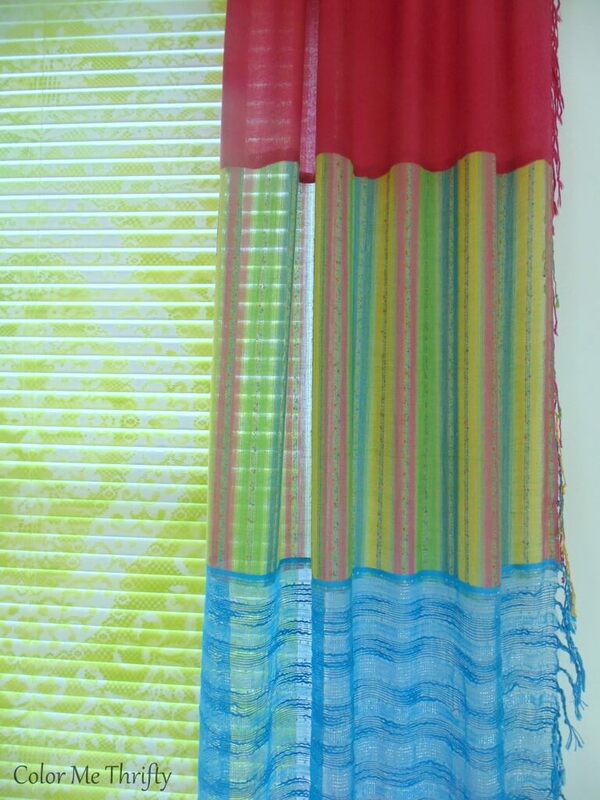 Love how they look with your funky colorful blinds! I’ve had an idea in mind for some time to make a solid scarf curtain for a doorway without a door going into our bathroom . Solid meaning a panel. You’ve inspired me to get it done. Love, love, love the hippie/boho vibe!! AND, the idea to not sew them is even better! Again, you have impressed me…thanks for sharing!! These are awesome! So cheerful and add such a good vibe. Love them.